Delhi-Based startup BigFoot Retail Solutions Pvt Ltd, which owns and operates KartRocket.com, a do-it-yourself (DIY) e-commerce platform for Indian small and medium enterprises (SMEs) and retailers, has raised an undisclosed amount in seed funding from 5ideas Startup Superfuel and 500 Startups. 5ideas Startup Superfuel led the round, which also saw participation from Jatin Aneja, partner at Amarchand Mangaldas. The money will be used for increasing sales, as well as scaling up technology and services offered. Pankaj Jain, venture partner at 500 Startups, said, "The ability to sell across multiple markets and countries plus being able to manage the whole process from one dashboard is critical for retailers. The KartRocket team has built a platform that solves a tremendous pain point for retailers and we are very happy to have its team join the 500 Startups family in India." KartRocket provides a DIY e-commerce platform that enables Indian SMEs to launch their own e-commerce sites. The offerings include a number of storefront designs, domestic and international payment options, a shipping platform (ShipRocket) integrated with domestic and international logistic carriers, as well as a single shipping dashboard that helps SMEs manage their shipping and returns. Stores on KartRocket are already mobile ready, and the company also helps SMEs sell more (and gain new customers) by integrating the ability to sell and manage orders across leading marketplaces such as eBay and Amazon at the click of a button. In addition, the company offers in-built marketing features such as coupons, gift certificates and automatic onsite search engine optimisation (SEO). The stores come at a made-for-India pricing starting at Rs 500 per month and going up to Rs 7,000 per month (for the fully loaded package). The startup launched its public beta in January this year and claims to have acquired over 100 paying customers and more than 500 trial customers in categories such as clothing, designerwear, accessories, mobiles and electronics, food items, baby products, home and garden and industrial products. The brands that are already running their e-commerce stores on KartRocket include DaMilano, Karol Bagh Saree House, Valyoo Technologies, GlobaliteSport and Fotocolor Emporium. The startup was founded in 2011 by Saahil Goel (CEO), Gautam Kapoor (COO) and Vishesh Khurana (CSO). Prior to KartRocket, Goel worked at companies such as SDLC Partners, Kasper Consulting and Max New York Life Insurance Ltd. Goel holds an MBA in strategy from University of Pittsburgh Joseph M Katz Graduate School of Business (the US). Kapoor has worked at companies such as JKE Automation and Bosch Rexroth, and holds a BBA from Western International University, Arizona (the US). Khurana earlier worked at Mobiz Infotech, SD Industries, Interactive Media Pvt Ltd, and holds a BBA degree in marketing from Amity Business School, Noida. "We realised that the only way to offer a platform like this to an Indian SME would be to offer the entire solution. The challenge was in productising it on a pay-as-you-go and self-service model. 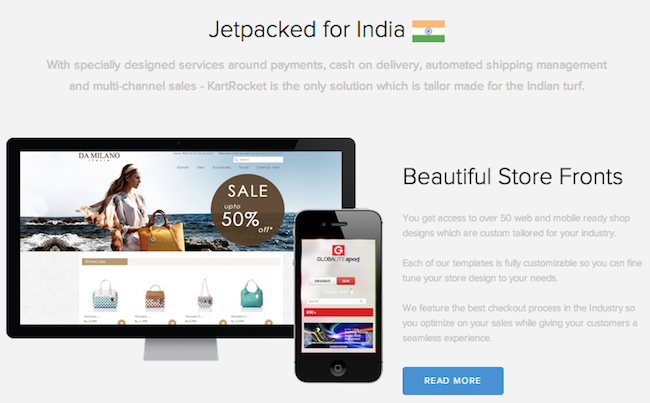 In comparison with other domestic and international shopping cart platforms, KartRocket provides better sell and ship features, pricing and India SME ready customer service," said Goel. 5ideas Startup Superfuel, part of the 5ideas platform, is an early stage venture capital initiative launched by Pearl Uppal and Gaurav Kachru who earlier headed the e-commerce ventures of the Delhi-based Smile Group. 500 Startups provides early-stage companies with up to $250K in funding, an opportunity to be part of its startup accelerator programme, as well as participation in events like SmashSummit, UnSexy, and GeeksOnaPlane. Other players that offer similar DIY platforms include Shopify, Zepo and Infibeam's BuildaBazaar. Online payment company PayU India had also launched (April 2013) PayUPaisa, a web-based product that enables small and medium sellers to put their stores online in minutes and transact through the PayU gateway. Early this month, Goa-based PowerStores E-Commerce Pvt Ltd, which owns and operates PowerStores, a do-it-yourself e-commerce platform that allows anyone to create an online store in a short time, raised $2 million from a Hong Kong-based investor.